This year, I wanted to decorate the Breakfast room in pinks. I started with the pretty pink tablecloth with roses from Linen Tablecoth. 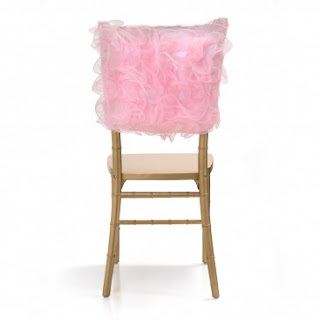 It is an 108 " round Rosette Sequin in blush pink. Pretty little pearl napkin rings hold the pink napkins. 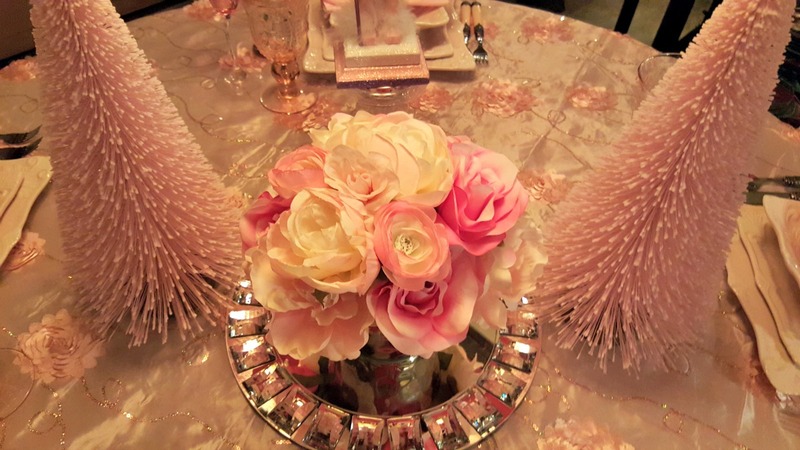 A pretty mirror charger sits in the middle of the table under the pretty pink roses, with pink Christmas trees on each side. I always love to dress our chandeliers. I used pearl garland with crystal snowflakes. The rose garland sits on top. 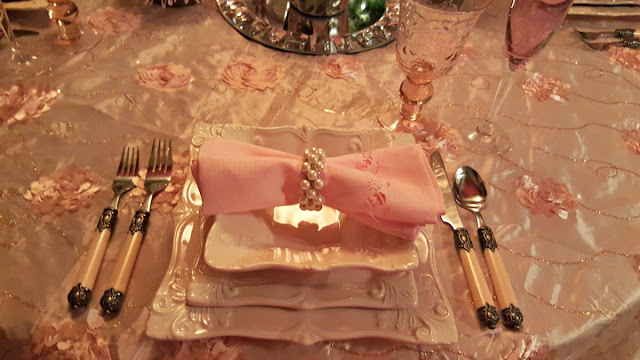 I had been admiring some light pink dinnerware from Horchow for quite some time. The dishes are called Pink Square Baroque Dinnerware. The goblets are also from Horchow in a light pink. Renaissance Glassware. Cream colored flatware completes the setting. 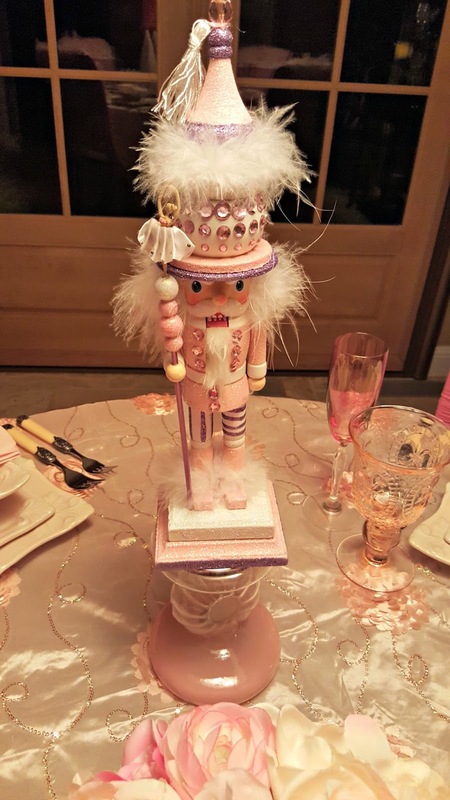 Love my new little pink nutcracker. the chairs with the caps. I think I need to make an adjustment, because I love the chair cap look. I was going to swap our those chairs for my smaller folding chairs. Where does the time go? I have two dinner parties planned and a Brunch. Happy Holidays. This PINK gal loves your tablescape! Those dishes are stunning. What you do with Chandeliers is absolutely amazing. The chair covers are so pretty, too. I'd love to sit down at that table for dinner with you. 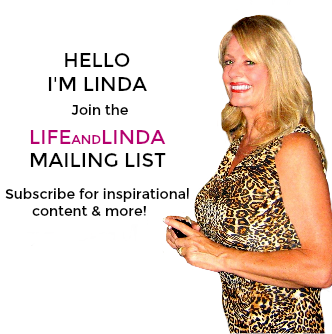 Hi Linda, this is just gorgeous all in pink. Love all the details and the romance of the setting. You turned the chandy into a work of art. Beautiful my friend and your talents are over the moon!! I love it! How gorgeous would this be for a wedding party, too. You need to get yourself a copy of the new book from House Beautiful, called, you guessed it, PINK! That awful day in SB was the day it arrived, and I shut off the TV and read the whole book. I guess it is true that pink does make you feel better. Absolutely charming and gloriously welcoming! The whole world is PINK to me lately, for I seek it out, and find it serendipitously, with such lovely scenes as these a bright light in my days. Since we last spoke about your helping me with some "click buttons" for LAWN TEA, we've gone through the rigors and clutter of a NEW PINK KITCHEN! Exclamation points and caps required, because of the long wait and it's finally here. 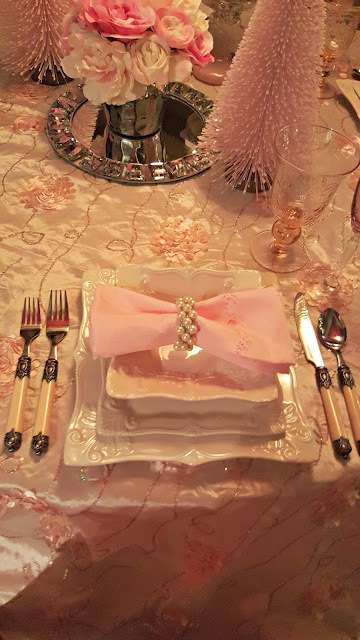 I so love this sweet table setting, with all the shades of blush and pinks---no food required. I'd simply sit there and look my eyes full, and be filled. It's simply too lovely, and I thank you for such a grand invitation to come and see. 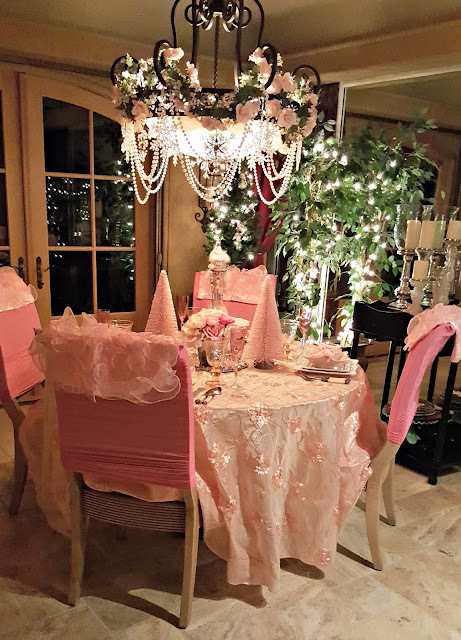 It's a Party in Pink and it all looks so pretty and inviting. 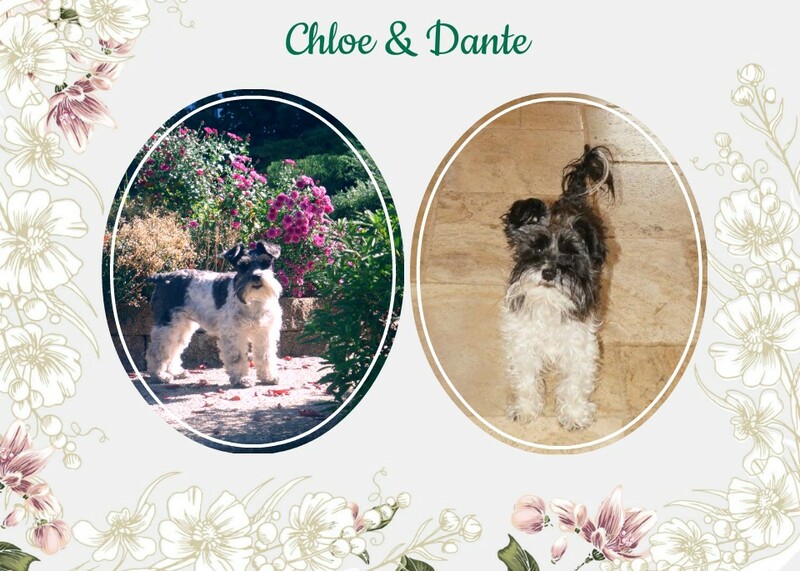 Wishing you a beautiful day, Linda, and thanks for all the lovely pics! I hope you are in the pink too. Oh this is so pretty! 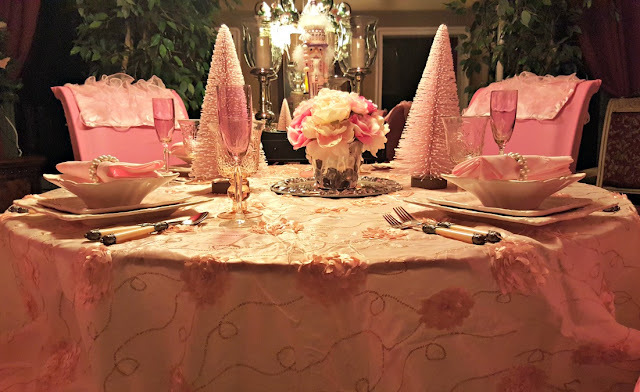 Love the pink trees and the gorgeous tablecloth! This is so glamorous and fantasy like! Oh Linda, I just love,this pretty in pink table!!! 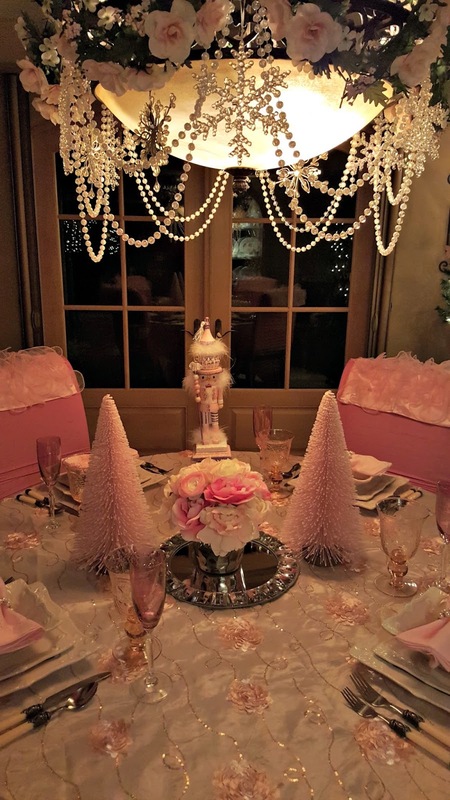 The tablecloth is just so dreamy and the chandelier is just gorgeous. 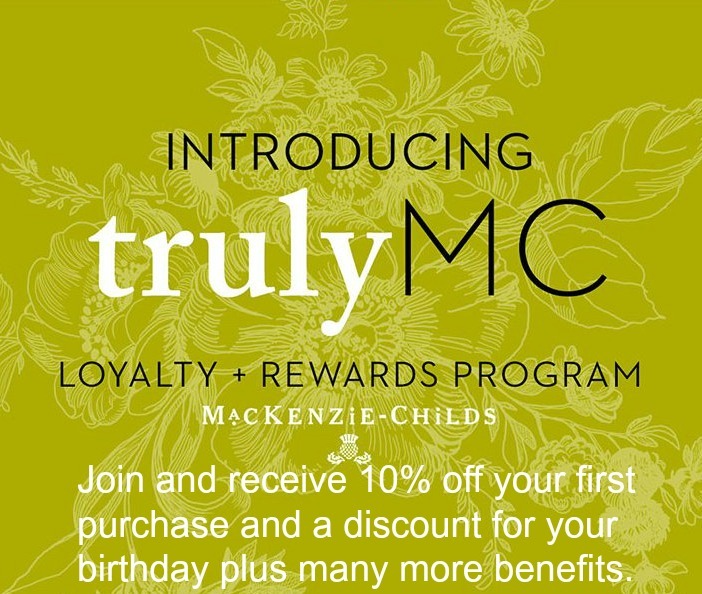 I'd love to be a guest at your table for dinner or brunch! Your table is BEAUTIFUL. With such a dreamy quality. That tablecloth is gorgeous. I also love your bottle brush trees. I love love love the pink baroque plates from Horchow, as I have them as well. 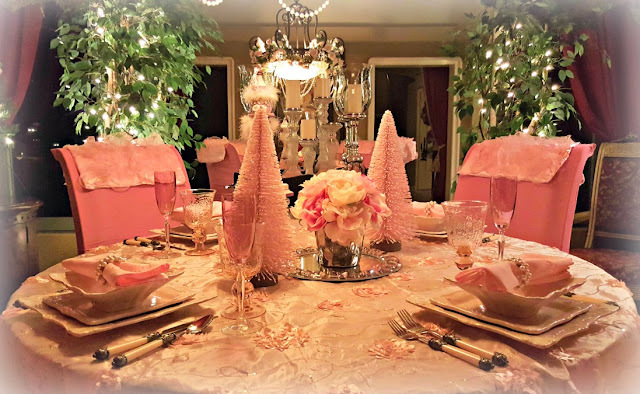 It is so nice to see a tablescape that is unique and so beautiful but still speaks of Christmas. This is a spectacular table setting, my dear friend. 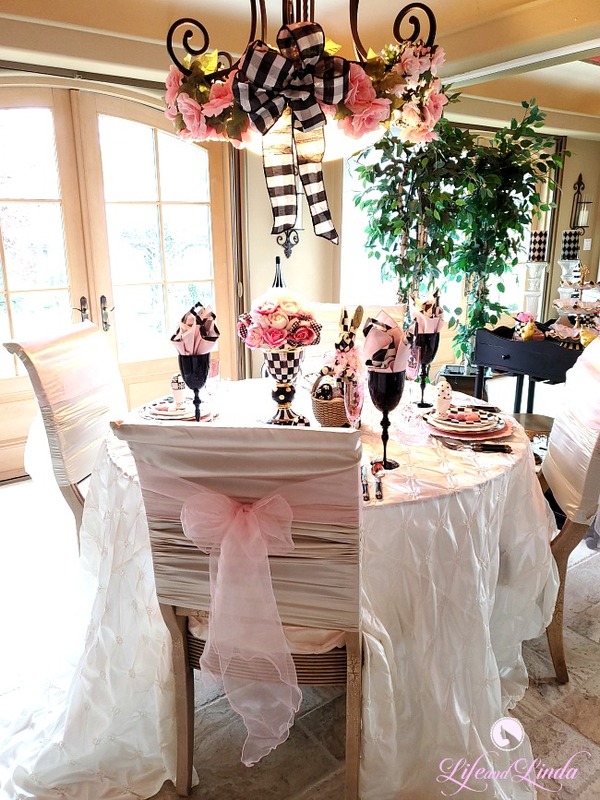 Everything about it is lovely and oh the way you have used various shades of pink. 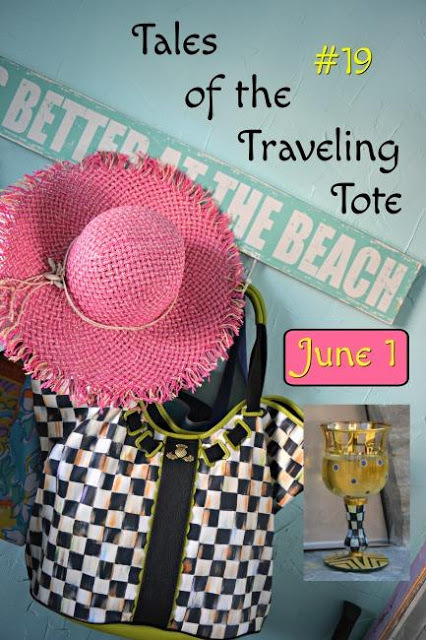 Horchow has the best of everything and I always feel pampered just looking at their website. I just don't know how this table setting could ever be topped! Enjoy your upcoming parties, they sound marvelous. So pretty! Pink is so pretty. 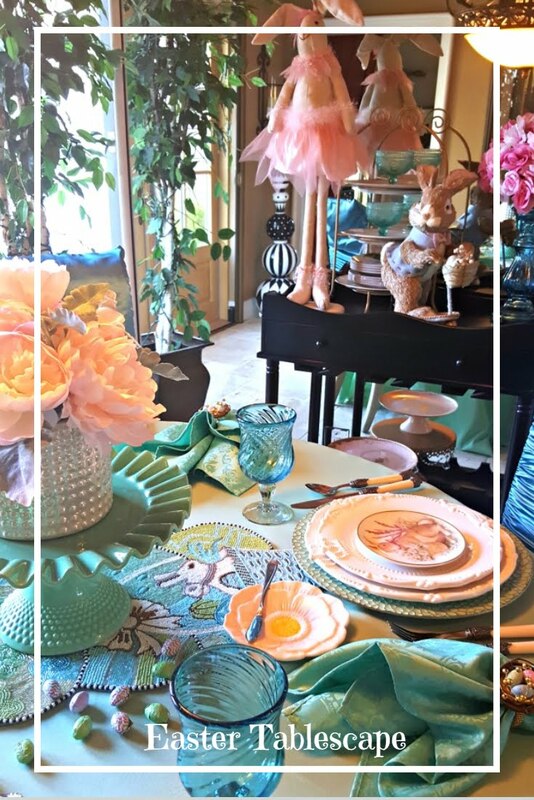 I love the idea of dressing a table like this for a girl's night in! Thanks so much for sharing over at Celebrate Your Story. So pretty Linda, every girls fantasy!! Love the pink Christmas trees and the blinged out chandy! 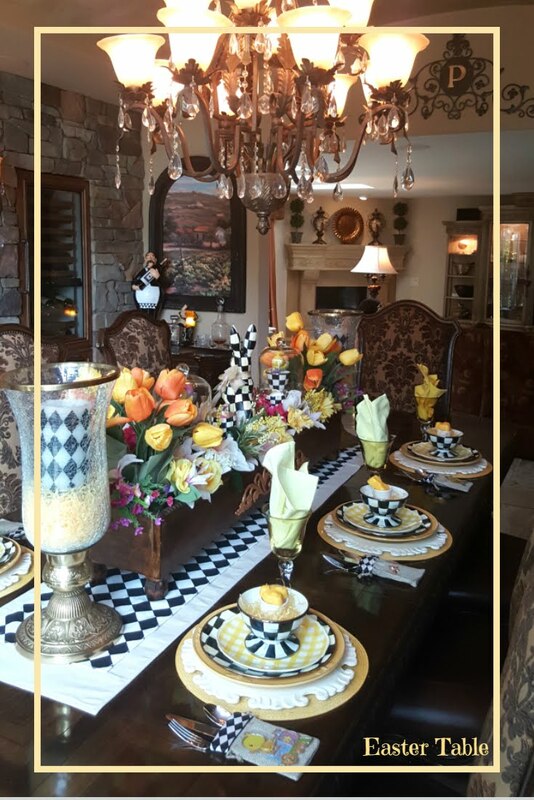 Your guests will be wowed! Happy holidays, and have fun with your parties! This is so different and beautiful! Happy to have found you via Celebrate Your Story. Wow, I didn't realize I missed so much in early December when I didn't get on line because I was entertaining in my home. 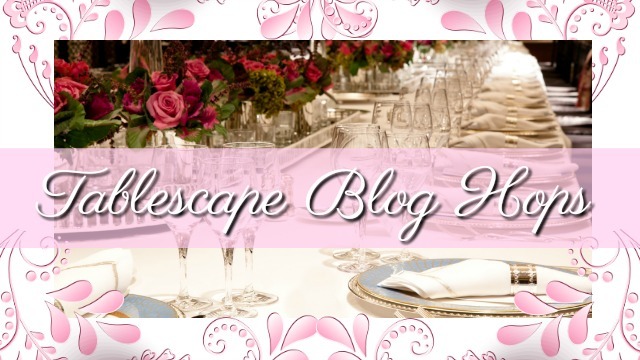 How does everyone blog and entertain? A stunning table as always!